When you’ve moved to a new town, what’s the best way you’ve found to connect with people? I’m thankful that there has been a handful of folks that we knew when we moved to Cleveland- it’s been great to be invited over for meals, go out to record shops we would have never known about and have people over for game nights. It’s made the transition here a lot easier (you know who you are- thank you friends!). I’ve moved a few other times in my life- in high school, to college, to Grand Rapids after college when I still had the crazy idea I’d go to law school and worked in a law firm to see if I’d like it. Can you picture me sitting behind a desk? I can barely sit still let alone sit behind a desk for 8 hours. 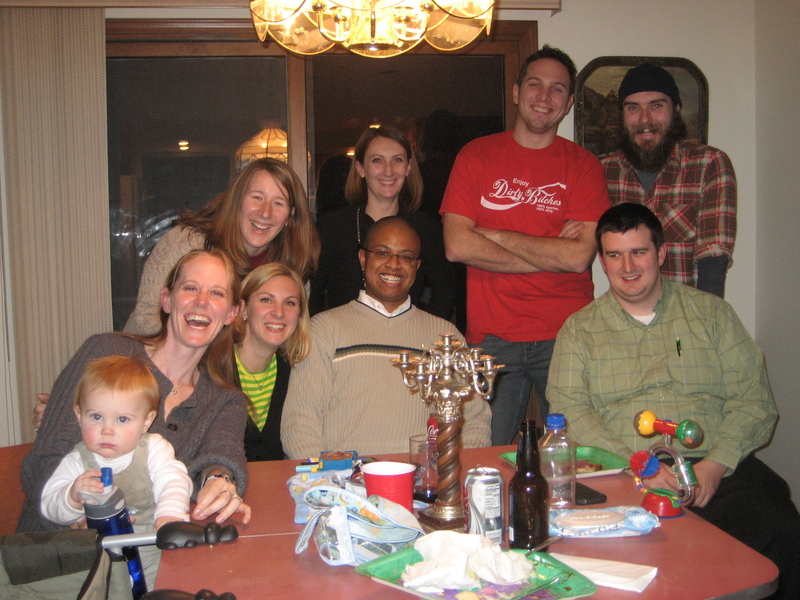 the 9th annual international holiday ho-down- friends from MSU that all met in Armstrong hall back in 1996! When you’re an adult you have to work much harder at connecting with people and finding the places where you could develop friendships. For some people it’s a bar where they can cheer for a baseball match of their favorite team with other fans, a soccer club where they can get exercise and meet other futbol enthusiasts, a knitting group, church or coffeehouse. So far the place that feels most like this for me is the Phoenix Coffeehouse- slightly grungy beatnik atmosphere, people studying quietly, and good coffee brewing. The problem is, people usually come to coffeeshops to meet other friends, silently study or write or chill out by themselves. Not a great place to make friends unless you consider befriending the baristas, and they’re paid to talk to people while they serve coffee. 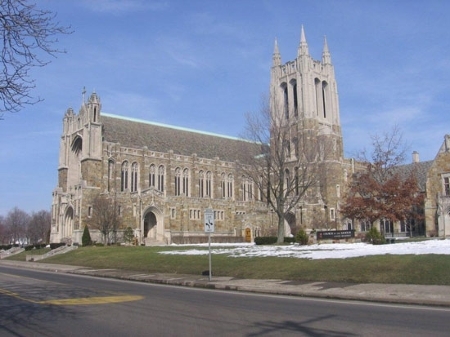 We’ve been attending a beautiful methodist church and trying to connect with people there- however, ironically, church isn’t the easiest place to connect with people. Church of the Savior here in Cleveland Heights. I grew up going to a church that looked similar to this- it is gorgeous inside & has been an inspiring place to worship. I know we’ll continue to meet and connect with people the longer we live here and I have to remember that getting into a routine where I can see the same people in the same places will help. But in the mean time, it’s been lonely. When I see people that look like other friends in my life I start to imagine that maybe they could be as cool as the friends that are no longer near me and that they too would be people I could laugh with, share childcare and have over to play settlers of catan into the wee hours of the night, regretting it the next morning when our son wakes up ridiculously early- because that is the Murphy’s law of parenting; the later you stay up, the earlier your child will wake up. For now I’ll be hitting up the library story hours, scouting for potential cool mom friends, smiling warmly at people at church and trying to strike up conversations, and going to yoga class to meet other people who are down with downward dog. oh, man, Jess! 🙁 Sorry to hear how hard it’s been. Also, have you looked into local book clubs for 30ish women? Lastly, and after this I’m fresh out of ideas…. how about a Church small group? By the looks of that joint I’m not sure they have small groups, but perhaps a different Church does where you guys could get involved there, but still worship Sun. morning at church of the holy savior or whatev that name was. your post is a good reminder to pray for your transition more often. Luckily for you you are outgoing. But it’s still hard. I know you were called to Cleveland, though, and I don’t think that you were called to be lonely. So hopefully this too shall pass–soon!